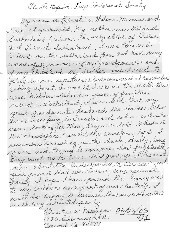 Caption: Handwritten affidavit by Ernestine Wilson Meenan concerning the Sutherland-Wilson farmhouse and the underground railroad. Click image for larger version. A transcript follows. My name is Ernestine Wilson Meenan and I am 78 years old. My mother was Mildred Sutherland Wilson, the only child of Delia and Ernest Sutherland. I was born and raised on the Sutherland farm and have many wonderful memories of my grandparents and of my childhood. My brother and I used to play in an upstairs bedroom and I remember asking about a small door in the wall that was hidden behind a piece of furniture called a washstand. I was told that my great-grandparents harbored the slaves who were escaping to Canada and when authorities came looking for them, they were told to hide in the "crawlspace" until the searchers left. I remember crawling in the dark, dusty, long space and trying to imagine how frightened they must have been. 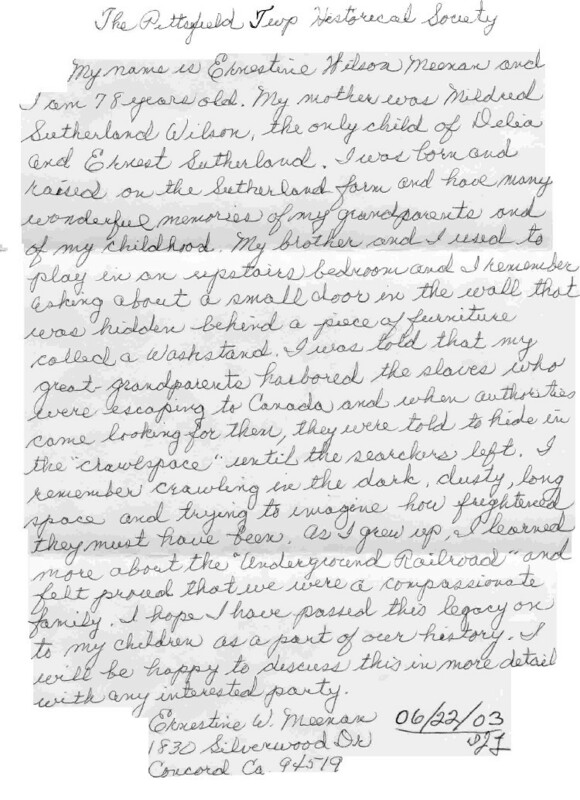 As I grew up, I learned more about the "Underground Railroad" and felt proud that we were a compassionate family. I hope I have passed this legacy on to my children as a part of our history. I will be happy to discuss this in more detail with any interested party.